I'm booted into MX15 right now, which does not have Conky Manager. but one is old syntax conky and the other is new syntax conky. No freeze. I'm wondering if it's the complexity of your main conky. Maybe there's some command or line within that just doesn't go with the weather script. Or you could also try to start your 2 conkies with the script above instead of the command you are using. No harm trying, right? Sure I could try that startup method, where do I put that script? How do I name it, do I make it executable (I assume yes), and then how do I autostart it in session and startup? Hang on. Ok, I'm running eadwine's basic conky with the weather conky and on my machine, the basic conky disappears after about 30 secs. Argh. Going to take a break from this puzzle. Going out. Eadwine Rose wrote: I could try that startup method, where do I put that script? How do I name it, do I make it executable (I assume yes), and then how do I autostart it in session and startup? Been overtaken by events since I can't make your conky stay on my desktop, but I just saved it as "start_conky.sh" in my home folder. I do have to close the terminal manually, it will not close on its own. Edit: and it's frozen again. The freeze times are different as well. Sometimes it runs half an hour, other times it runs maybe 15 minutes. I think I have found the error. To make it easier to see, I gave the decoration back to the window. This version runs since this morning without the freezing effect next to the weather conky of eadwine. Due to the length of the headlines of your rss messages, the window now behaves dynamically. What I don't understand are these entries (where I changed eth0 to see an ad). I also don't understand why you don't implement the hints you are shown. For example, I didn't understand your error message at the beginning. 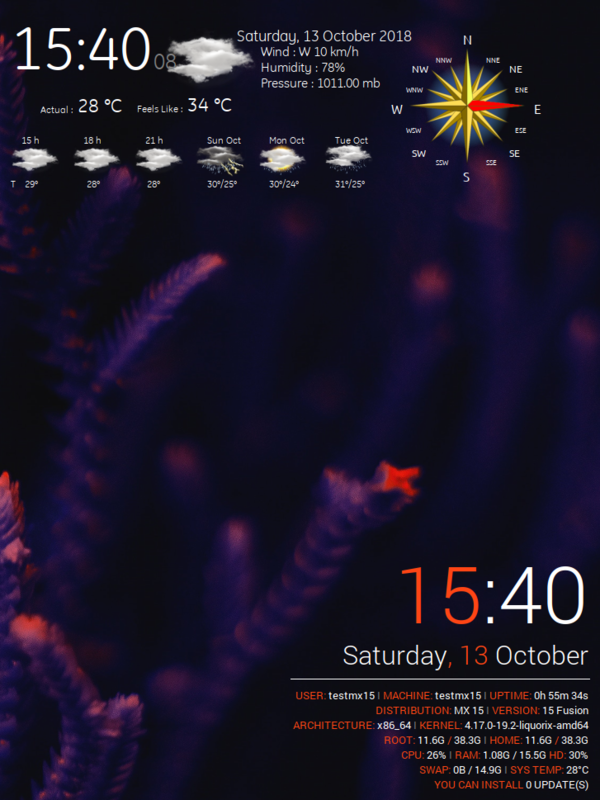 With this Conky fills the memory to a standstill / freeze. If you want to read above, I have pointed that out first. The same with the "aktualisiert" what you criticized, it's still in your configuration and, more. Male is the capital of the Maldives and its wonderful people. Somewhere some point in time I had to look up the numbers because the scaling of the graph didn't pan out. As in, when it was going at full download speed of my connection the graph didn't get to the top but only like two pixels. Those numbers sort that. Changed them, all seems to be ok. Yes I took that aktualisiert out and then put it back in since removing it messes with the position of the weather icons. I have been starting the basic conky without the & since .. forever and a day, so I didn't know that was required and figured it was just superfluous. Mind.. my memory wasn't full.. Nothing BUT the conky froze. But let's see what it does now. Started it with asqwerths script, so the & is included now. Edit: over an hour in, and still running! another edit: added the startup script to session and autostart. Thanks asqwerth for those!! I restarted both, and now the basic conky is stuck again. Seriously I doubt we will ever find what the cause is, so.. let's just let it go. In the other direction: I prefer a simpler, aesthetically appealing conky for everyday use. I have fooled around with the MX-Cowan_more supplied in the default set and came up with a version that works for me. and here is my simplification with addition of basic system info as we do in others, spacing improved and colored with MX Conky to match the default 17.1 wallpaper. I have seen from some Nice screenshots of MX-18 that the CPU temps are not reading Properly and the net speed is fixed to Kbs this code should fix the issues.. Sigh. Just a rant that NOAA has discontinued its service at the end of 2018. I knew it was coming, but it's a bit of a pain to switch my conkies to 1_accuweather_RSS just to display the current temperature, and in the end I just let it display the whole current forecast. When I have more time I'll have to see if I can understand the awk and print $NF thing to get just the temperature showing. In any case, I took the opportunity to finally use the 1_accuweather_RSS script for the first time. My conkies using the older 1d_accuweather_rss script are still working so I never bothered to use the newer script until now.